Yesterday’s preview covered the Nitro divisions, so today’s edition will give a look at the Pro Stock category and touch on the Pro Stock Motorcycles. All eyes were surely on the Pro Stock category the last time the Mello Yello Drag Racing Series visited Pomona at the end of 2014. It came down to a final round match up between Erica Enders-Stevens and Jason Line for the championship. What does 2015 hold and who are the contenders for the title this season? Enders-Stevens is the defending Pro Stock champion, and not only that, but she’s coming off a season where she had six wins and six No. 1 qualifiers. That is absolutely a breakout year and she has the stability of returning with the same organization. Our car and our lane was the mantra last year as she honed her focus and she plans to take the same approach in 2015. “We’re the defending world champions, and it’s a pretty awesome place to be,” Enders-Stevens said. “It’s pretty cool. I’ve never been in that situation before, and we’re really excited and honored to carry the No. 1 this year. It’ll be a memorable year, and we’re going to go to Pomona and give it our all and hopefully carry No. 1 into 2016 also. That’s everyone’s goal. Line was the guy that came up oh so short last year. Still, it was a great year featuring four wins and a lot of time at the top of the charts, particularly in the Countdown. Line is also the defending Winternationals champion so he certainly hopes to start this season off on the same note. He’s not the sort to get discouraged or give up so you can bet he’ll be challenging the whole way once again. 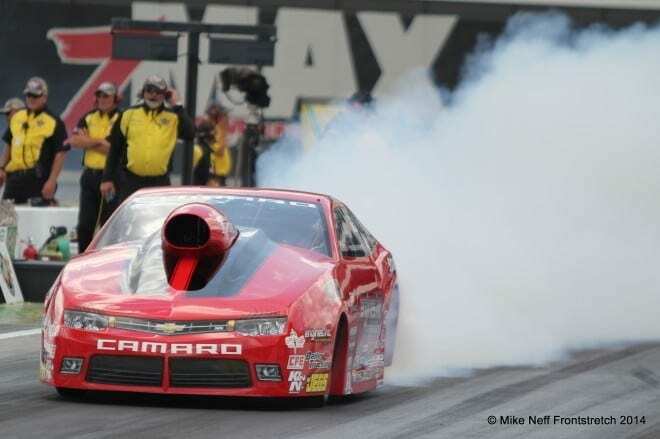 The driver Erica Enders-Stevens regards as somewhat of a mentor should not be overlooked. Johnson won four races last year along with two runner up finishes. It was his first season racing the new Dodge Dart so he returns this year with a year under his belt with the new car. Johnson was the 2012 Pro Stock World Champion. That final spot in the three was a little bit of a debate because right on the heels of those drivers, the Gray Motorsports duo, brothers Shane and Jonathan Gray, are absolutely looking to be part of the conversation. Shane finished fourth in points and scored a win at the biggest race of the year, the U.S. Nationals in Indianapolis. Brother Jonathan won once, added two runner-up finishes, and made the Countdown cut in his rookie season in 2014. Greg Anderson was the guy Jonathan Gray beat out for the final Countdown spot last year, but in Anderson’s defense, he missed the first five races of 2014 after heart surgery. That won’t be a problem this year as Anderson is back to health and ready to go. “We’re here already, the first race of the season, and we can’t wait to go racing. It’s what we love. The best part for me is that I’m here this year. I get to start the season in Pomona, and I’m excited,” said Anderson. Other drivers to note include Vincent Nobile, Rodger Brogdon, and Chris McGaha. Veteran Larry Morgan returns for his 29th season. This year he will have a new car, engines from Gray Motorsports, and a new sponsor in FireAde. “I’m looking forward to this year because Gray Motorsports has good power, I’ve got a good car, and I have the best sponsor,” Morgan said. While Anderson was recovering last year, Swedish driver and nine time FIA Pro Stock champion Jimmy Alund filled in. Alund enjoyed his time here so much, he’s coming back for a part-time schedule this year. Alund will be in Pomona this weekend and if things go well, he hopes to get sponsorship to run at least four, and maybe up to six events. Alund will race with his team, but will use a Pontiac GXP that Jason Line won the championship with in 2011 and will get engines from the KB Racing team as well. We’ll toss out a top three for this category now, but to be honest, this group has one more month of off-season before they take to the track at the Gatornationals next month. To that end, teams are still working hard in their shops and news is slow. Look for a more extensive preview of this category in our regular Thursday “Nitro Shots” column the week before the Gatornationals. On to that top three. Hector Arana Sr. and Jr. will return for the 2015 season although younger son Adam has left the series to pursue a career in the U.S. Coast Guard. This could really go either way. The Vance and Hines team has owned this category and will probably continue to do so, but as far as which rider has the advantage, the answer is really neither. They’ve both won championships. If it comes down to making a choice, maybe give it to Hines because he’s the defending champion. With brother Adam gone to the Coast Guard, the family team will have just two bikes this season, meaning less division of focus for Hector, Sr. who tunes them. Given that Hector, Jr. was the closest guy to the Vance and Hines riders last year, he looks good to give it a go to try to catch them again. Matt Smith could also be a strong contender. He and wife Angie Smith will be a factory team for Victory Motorcycles this season which could be a good thing having support, or could be a question mark as they learn their new rides.